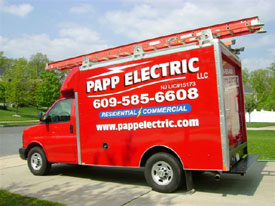 At Papp Electric LLC, we complete all work in compliance with the latest electrical codes and standards and do not believe in taking shortcuts. We guarantee all of our work to pass inspection. We strive to arrive at each job site with the required tools and materials needed to get the job done in a reasonable amount of time and for a reasonable price. When we leave your job site, you can relax and enjoy the work performed without having to spend hours cleaning up after us. Most complaints people often have about other contractors usually includes them not showing up on time or failing to complete the work. Most of the time, we arrive to our appointments within minutes of the scheduled time. We do not believe in having customers wait around for us to show up. If an unforeseen delay should arise, we will remain in contact with the customer to let him or her know about any changes in arrival time. Job completion is also very important to us. We will not let your job sit idle for extended periods waiting for its completion. Papp Electric LLC is a company that is continuously growing without changing morals and policies that have served as its foundation from the very beginning. We stand behind our work 100%. We believe that no job is too small and will accept calls for smaller jobs that other companies often deem are not worth their time. No matter the size of the job, we will always treat you with the utmost respect. Give us a call and let us help you with your electrical needs.